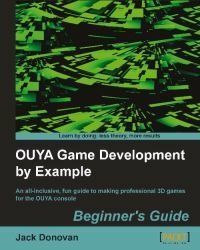 The latest book from Packt Publishing that I got a chance to review, was Jack Donovan's OUYA Game Development by Example. One could easily say that it's more than a bit from my usual field of expertise. I'm no game developer (the stuff I was doing while still in school doesn't count) and I don't own an OUYA. Well, at least I know a lot about C# which was used as the scripting language in the book. One could also say that because of that I am the target audience for the book. Still, even with my lack of previous experience, the book starts out really slow; too slow in my eyes. Though this should make it all that more suitable for complete beginners who have never programmed before. C# is explained from the very basics which is quite a challenge considering the small number of pages dedicated to this topic. As a side effect, there are a couple of inaccuracies and over-simplifications, but hopefully readers will grab a more in/depth book about C# and programming afterwards. Of course, most of the book focuses on Unity and gives a quite thorough overview of the basics through examples which make a lot of sense by the end of the book. The author's experience with game development definitely shines through in these sample games. There's also not much OUYA or Android specifics, except for the obvious setup of development environment and instruction on publishing and monetization options. I did get the feeling though, that the book focuses too much on step by step instructions and lacks a bit on the bigger picture, explaining why we're actually doing all these things and how it works under the cover. Obviously, the reader will again have to find this information in a more advanced book. I liked a lot how throughout the book there are many calls to action, giving the reader challenges to complete on his own. But still, this book can really serve only as the first step on the path to becoming a game developer, albeit a good one. The author is aware of that and therefore concludes with a couple of more advanced topics, such as development methodologies, source control, and architectural patterns; probably hoping to make the reader craving for more. I can sincerely recommend the book to anyone, trying to get a glimpse into the world of game development. It's enough to see if that's something for you and worth exploring further.